Standing Stones: You can also place a stone on end, as shown here. Standing stones do not count as part of your road, and nothing can be stacked on top of them. This makes them good for blocking, so they are sometimes called "walls". Capstones: Capstones combine the best aspects of standing and flat stones. They do count as part of a road, and they can't have other pieces stacked on top of them. In addition, a capstone can move onto a standing stone (of either color) and flatten it. When the capstone flattens a standing stone, it must act by itself, although this can happen at the end of a longer move. Players will take turns. On each turn you may either place a new piece on an empty space, or move a stack of pieces that is under your control. A winning road connects opposite sides of the board. 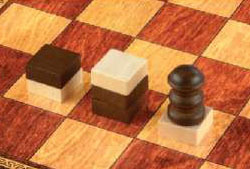 Spaces on the Tak board are connected only by their edges. Roads do not connect diagonally, and pieces do not move diagonally. The game ends if either player makes a road, or runs out of pieces, or if the board is completely full. If the game ends without a road, then the player with the most flat stones wins. Details in the pages that follow. The board starts empty. Check that each player has 21 stones and one capstone. In the first game, determine randomly who will go first. After that, you should take turns going first. On the first turn of the game, each player places one of their opponent's stones. You may play this stone in any empty space, and it must be flat. After this, players play their own stones. For example, if White goes first, White plays a Black flat stone, then Black plays a White flat stone, then White takes the first normal turn. Note: There is no standard for 7x7. This style of board is considered bad luck, and is rarely used. 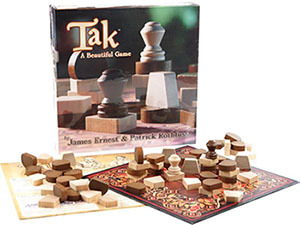 Calling "Tak": You will typically call "Tak" in a friendly game, but it isn't strictly required. Like "check" in chess, this is a warning that you are one move from winning. 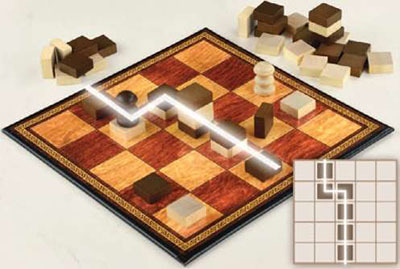 The goal is to create a road, which is a string of your pieces connecting opposite sides of the board. A road does not have to be a straight line. Standing stones cannot be part of your road, but your capstone can. Spaces do not connect diagonally. 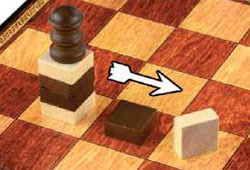 In the illustration below, Black has won by connecting two opposite sides of the board with a road. Each space along this path has a stack with a black flat stone or capstone on top. 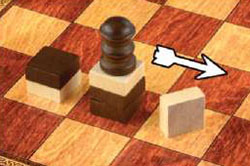 Flat Win: If either player runs out of pieces, or if the board is full, then the game ends. If neither player has a road, then the player with the most flat stones wins. Count only the flat stones on top of stacks, not those buried within stacks. If this is tied, the game is a draw. Double Road: If a player creates a winning road for both players in the same move, then the active player is the winner. (That is, the player whose turn it is). For example, if White creates both a white road and a black road, then White wins because it is White's turn. On your turn you may either place a piece in an empty space, or move one of the stacks under your control. Note: If you place your last piece, or if you fill the last space on the board, this ends the game. See Other Ways to Win at left. Place: You can place a flat stone, standing stone, or capstone in any empty space on the board. You never play a new piece directly on another one. Stacks form only as a result of movement. Move: You can move one or more pieces in a stack that you control. A stack can be any height, including just one piece. "Control" simply means that your piece is on top. To move a stack, take as many as five pieces off the top (see Carry Limit, at right), and move them in a straight line, dropping at least one piece off the bottom in each space along the way. The pieces that you drop will cover any stacks that are in their path. Capstones and standing stones block movement, because they cannot be covered. For example, this piece cannot move left, because that space is occupied by a standing stone. Standing stones and capstones move by the same rules as flat stones. If the piece above were a capstone, it would also have the option to move left, and flatten the standing stone (see Flattening Walls, at right). Carry Limit: There is no limit to the height of a stack, but there is a limit to the number of pieces that you can move. This "carry limit" is equal to the width of the board, so in a 5x5 game, you can carry no more than five pieces. 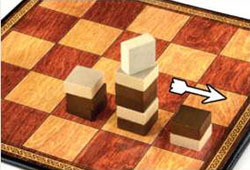 For example, with a carry limit of five, if you have a stack of seven pieces, you must leave at least two of those pieces in the starting space. Flattening Walls: A capstone can, by itself, move onto a standing stone and flatten it. The capstone may be part of a larger stack that is making a longer move, as long as the final step (flattening the wall) is done by the capstone alone. You can flatten your own standing stones as well as your opponent's. Note: Aside from flattening it with a capstone, you cannot lay down a standing stone. 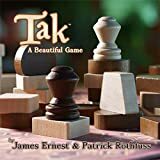 Traveling with Tak: You don't need a fancy board to play Tak. You can draw a board on paper, paint it onto a piece of cloth, or play with no board at all. To play without a board, use a flat object like a coin or scrap of paper to mark the center space. After a few turns, the shape of the board will come into clear view. To make this game as portable as possible, we have included a cloth bag for the pieces. Toss it into your backpack, or tie it to your belt, and take Tak with you everywhere! 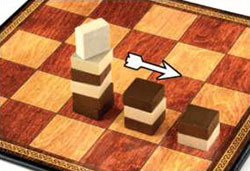 White controls the stack in this example, because her stone is on top. She will move the stack to the right, taking over Black's stacks. Let's break down this move one step at a time. This is a 5x5 board, so the carry limit is five. White could move the entire stack, or she could choose to leave some pieces behind. She decides to move the entire stack. Moving in a straight line, White must drop at least one piece in each space. These pieces come off the bottom. In the first space, she drops two pieces, and carries three. On the next space, she drops two pieces again, carrying just the top piece into the last space. The final position is shown in the last step. This single move has given White control of three spaces that once belonged to Black. Well played, White! ... and finally one piece. Capstones can move like any other piece. In addition, a capstone can flatten a standing stone, if it does so by itself. 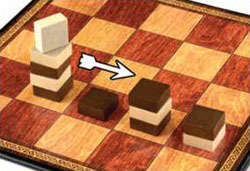 In this example, Black will move his capstone two spaces, to flatten White's standing stone. In the first step, Black could move up to five of these pieces, but he chooses to leave two pieces behind, and move three to the next space. (This leaves Black in control of the starting space). To flatten the standing stone, the capstone must go alone. Black leaves the rest of the pieces on the second space, and moves the capstone by itself onto the standing stone. With this move, Black has flattened White's standing stone, but has left White in control of the middle stack. This is not perfect for Black, but this type of result is fairly common. ...then carry the capstone to flatten the standing stone. To avoid leaving a white piece behind, the capstone would have to start with a black piece below it. Note again that capstones can flatten stones of either color (not just the opponent's color, as shown here). 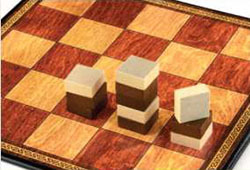 You'll quickly find that the simple rules of Tak leave room for a great deal of strategy. Movement is the key to understanding the game. A tall stack has many options, and a single move can alter the balance of power. You can learn the basics of the game by playing a few games at 4x4. Because there are no capstones at this size, standing stones are quite powerful and you'll learn how to use them for offense as well as defense. In the early game, be careful not to make too many moves; you need to put pieces into play, and not just move the pieces you have. In the late game, don't be afraid to "run out the clock", playing out your pieces, if you are winning on the flats. There is a slight advantage for the player who goes first. So, for a fair contest, you can keep score over multiple games. Your score for winning is equal to the size of the board (25 points in a 5x5 game), plus the number of pieces that remain in the winner's reserve. For example, if you win with four unplayed pieces, you score 29 points. This is 25 points for the board, and four points for your unplayed pieces. In the long run, better players will score more points by playing more efficiently. 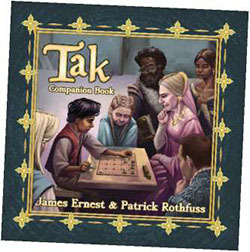 The game of Tak has recently enjoyed a surge in popularity at the University, where Kvothe studies the arcane arts. Here is one of many optional systems for placing wagers on the game, devised by Tak historian Daramin Centes. Ante: To begin, each player contributes an ante of ten coins. This creates a pot that will go to the winner of the game. Bidding: Players bid, in coins, for the right to go first. The high bidder goes first, and must pay his bid into the pot. (The second player pays nothing extra). 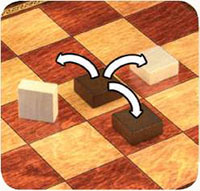 Calling Tak: When a player calls "Tak", her opponent must either add two coins to the pot, or resign. However, a player cannot be forced to pay this penalty twice in a row. 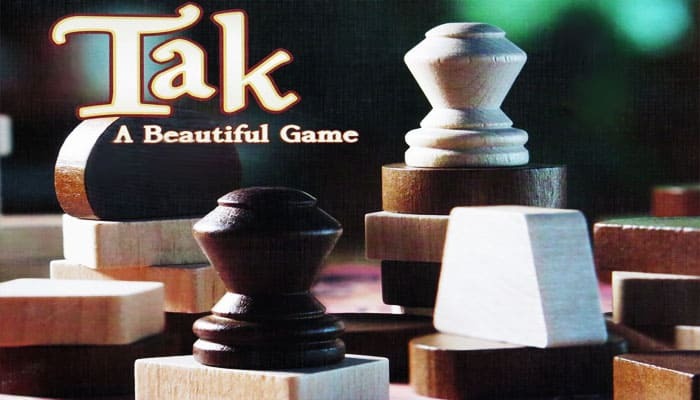 The obligation passes back and forth each time a different player calls "Tak". You can use a token to help remember who called it last. End Reward: The winner takes the pot, plus a bonus equal to the number of unplayed pieces in the winner's reserve. For example, if you win with five unplayed pieces, you win the pot plus an additional five coins from your opponent.